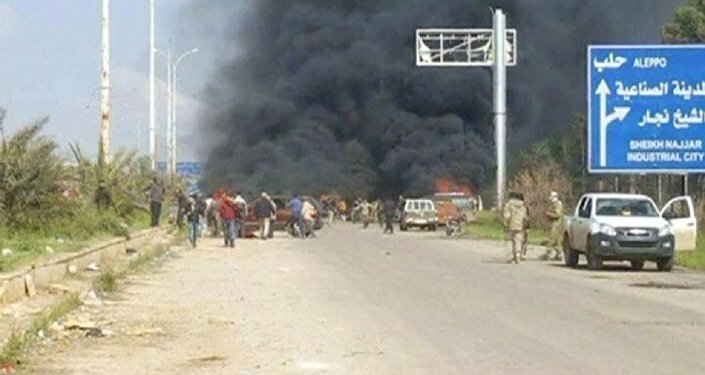 A source told Sputnik that a suicide blast targeting a bus convoy with evacuees from the besieged Syrian towns of Fua and Kefraya has risen to 70. Earlier in the day, a blast occurred near a bus convoy evacuating residents of the besieged Shiite towns of Fua and Kefraya to Aleppo. The previous death toll was 20 with 50 others injured. "The number of victims [in the explosion] is at least 70; over 130 are injured. It is difficult to say as there are many burnt bodies and body parts around the damaged buses," the source told Sputnik. According to the souce, there are many children and women among those killed. The explosion hit the Rashidin area on Aleppo's outskirts. The bus was waiting for entering the city of Aleppo. According to a Sputnik source in Aleppo, the blast supposedly was caused by a suicide attacker who detonated an explosive device. The car with the attacker approached the buses disguised as a vehicle transporting food. The evacuation of Fua and Kefraya residents is a part of a deal between the Syrian government and militants. On Friday, a convoy of 75 buses arrived in Aleppo, evacuating some 5 thousand people from the besieged cities. Fua and Kefraya are the only government-controlled enclave in Idlib's vast militant-held area. The towns of some 20,000 people have been under siege since 2013. The humanitarian situation remains dire, with a lack of food and basic necessities. The humanitarian situation in the towns of Fua and Kefraya has been deteriorating given that the aid convoys had been prevented by terror groups operating in Syria from reaching the towns.